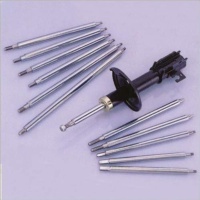 These piston rods are designed for all types of auto shock absorbers, including adjustable models. To meet customer specifications and special requirements, we make piston rods utilizing different processing methods based on different processing conditions. The effective high-frequency hardened surface of each piston rod is at least 0.25mm to 2mm thick; chrome-plated models have ultra-thin surfaces ranging from 10um to 30um, according to individual customer request. Surface roughness ranges from Rmax0.6um to Rmax0.2um.